Error vector magnitude (EVM) and noise power ratio (NPR) measurements are well-known approaches to quantify the inband performance of communication systems and their respective components. In contrast to NPR, EVM is an important design specification and is widely adopted by modern communication standards such as 802.11 (WLAN). However, EVM requires full demodulation, whereas NPR excels with simplicity requiring only power measurements in different frequency bands. Consequently, NPR measurements avoid bias due to insufficient synchronization and can be readily adapted to different standards and bandwidths. We argue that NPR-inspired measurements can replace EVM in many practically relevant cases. 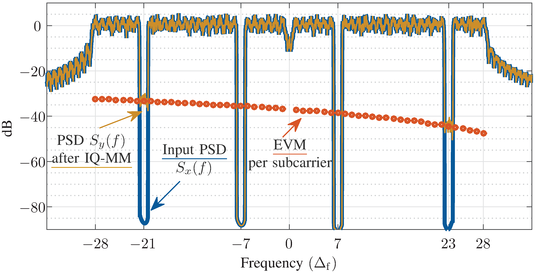 We show how to set up the signal generation and analysis for power-ratio-based estimation of EVM in orthogonal frequency-division multiplexing systems impaired by additive noise, power amplifier nonlinearity, phase noise, and in-phase–quadrature (IQ) imbalance. Our method samples frequency-dependent inband errors via a single measurement and can either include or exclude the effect of IQ mismatch using asymmetric or symmetric stopband locations, respectively. We present measurement results using an 802.11ac PA at different backoffs, corroborating the practicability and accuracy of our method. Using the same measurement chain, the mean absolute deviation from the EVM is less than 0.35 dB. Figure: To obtain the test signal for error power ratio (EPR) measurements, we apply a (multi-)stopband filter on an OFDM communication signal. The EPR estimates the error vector magnitude (EVM) at the stop-band locations by relating the DUT output power within the stopbands (error power) to the signal power. The figure depicts the power spectral densities obtained from an IQ mismatch simulation. By choosing symmetric stopbands locations (at -7,+7 OFDM subcarrier spacings Delta_f), the effect of IQ mismatch can be excluded, whereas with asymmetric locations (-21,+23), IQ mismatch is included, as with EVM. More information can be found in the paper.